It is, so much, an ordinary book of laws. And yet there is so much that is so very extraordinary. 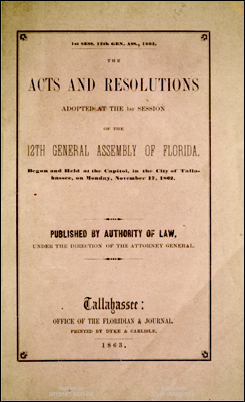 In so many ways, so much what the Florida Legislature did that term, when it met in the First Session of its 12th General Assembly, at the Capitol, in the City of Tallahassee, as reflected in the laws it passed was perfectly ordinary. It almost didn’t seem worth it for The Legal Genealogist to be poking around in the small volume last night while preparing for the 2017 Valentine Genealogy Seminar of the Indian River Genealogical Society, tomorrow, in Vero Beach. All normal ordinary acts of a Legislature at any time. And then it did all those other things that had to be done because of what was not ordinary — because of the time when and because of the place where that Legislature was sitting. It was, after all, 1862… in Florida. An extraordinarily ordinary law book… for an extraordinarily ordinary time.